The complete phased build-out of Oregon Square, as approved by the Design Commission in October 2016. Changes are being proposed to Block 103, shown at the right side of the image. Changes are being proposed to LU 16-195933. Block 103 (SE) within Phase 2 is being proposed to change from a multi-story residential building to a mixed-use speculative commercial office building. The building along with the approved design of block 102 (NE) along with the approved buildings in Phase 1 will surround a publicly accessed pedestrian-only plaza. Two levels of below grade parking are proposed beneath 103 with the opportunity to connect 90 (SW) and 91 (NW). Changes to blocks 90 and 91 will add one level of below grade parking. Construct a new 2-story church with parking lot at this location. Intent is to use the portion of the site zoned CN2 as the parking lot, and the R2a as the structure. Comprehensive Plan Map Amendment with Zone Map Amendment. The site would be rezoned from R1(Medium Density Multi-dwelling Residential) to CS (Storefront Commercial). The CS zone allows both commercial and residential uses. There is a two-story apartment building with 9 units on the site. The proposal is to redevelop the site with a 4-story mixed use building (Harvey Rice Heritage Center) with 20 residential units, 4,300 square feet of office on the second floor and 2,820 square feet of retail space on the ground floor. Ten on-site parking spaces are proposed with access from NE 14th Place. The parking area is partially underneath the second story of the building. New 3 story mixed use building; group B occupancy shell tenant space on half of first floor and apartments on remaining first, second, third floors. The Design Commission has approved revised designs for Oregon Square, which will now be split into two phases. 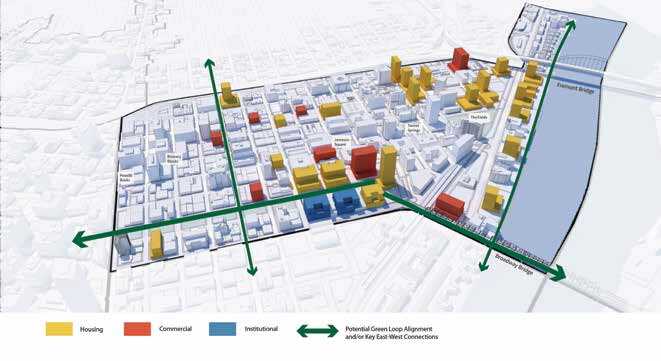 The project by GBD Architects will redevelop four city blocks in the Lloyd District owned by American Assets Trust, with development on the western two blocks happening first. The first phase, which will include Blocks 90 and 91, will have a combined total of 619 residential units, 23,738 sq ft of ground floor retail and 169 underground parking stalls. The buildings will be arranged around a new pedestrian only public space, designed by landscape architects PLACE. Design Advice Request for a Type III Design Review for the construction of a new 10-story mixed-use building with some ground-level retail and residential development, approximately 150 residential units. The project will include two-levels of below-grade parking. See parent folder (PC 16-175812). 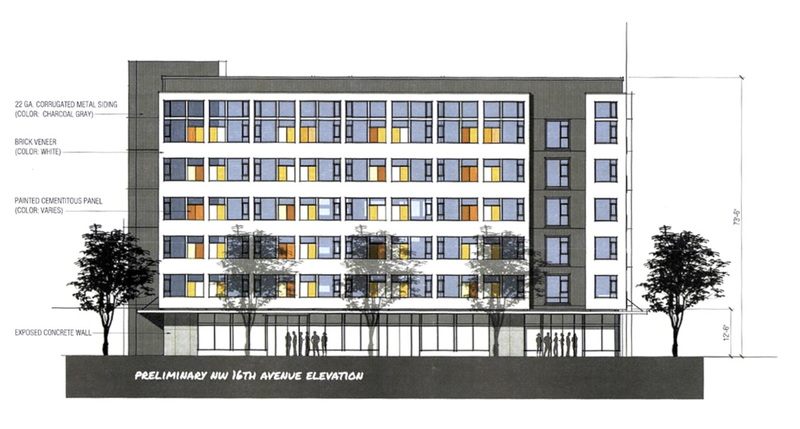 Proposal is for new four-story 84 unit apartment building with basement. New 3 Story 6 unit development with property to be divided; Questions regarding feasibility. Proposal is for a new four-story 45ft tall mixed-use/multi family residential development including 46 apartments, ground floor leaseable space, ROW and site improvements, landscaping and 51 long term and 3 short term bike parking stalls. On on-site parking provided. Project consists of new 80,000 sf four story building that will include 108 affordable housing units with approx. 10,000 sf of ground floor retail space and approx. 54 parking spaces. Early Assistance with meeting to discuss proposal for a new (5-story, 57′ tall) multi-family residential development. New development of a 69 unit affordable housing project with community room, orrices and service spaces on the ground floor with 24 parking spaces accessed off the alley. 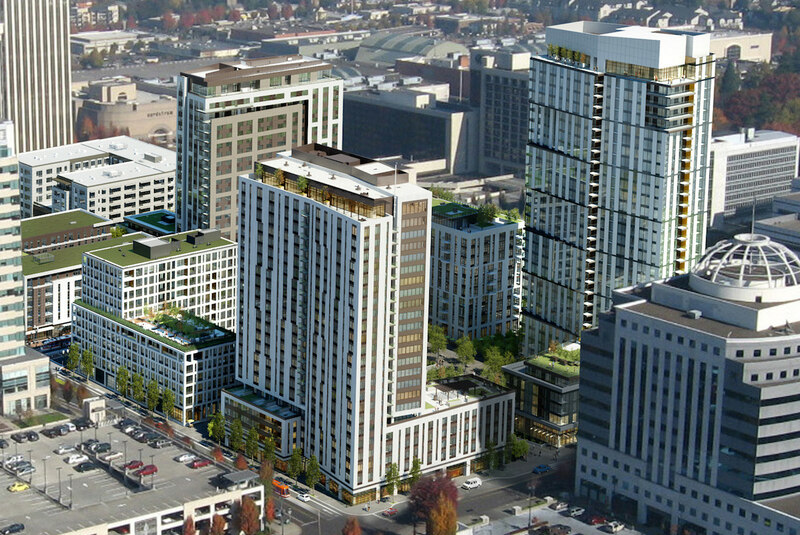 New 6 story market rate mixed-use/multi-family development. 90 units proposed with 1 floor mixed use retail, 21 car parking spaces and 139 bike parking spaces. Two lot land division in order to be able to build second hotel with 76 rooms on the proposed eastern lot. A Pre-Application Conference to discuss a proposal for a new twelve story building. The building is proposed to have 7,500 square feet of ground floor retail and approximately 264 residential units. Project is a mix of affordable and market rate housing. No parking is proposed. New construction of a twelve story building with 93 units of affordable housing, associated resident amenities and a ground floor commercial space on a 10,000 sf site. Parking for 16 cars will be provided on the ground floor. Type III Design Review for a 4-block phased development. Changes to LU 15-156716 are being proposed. Phase 1 is the superblock be developed into two apartment towers around a publicly accessed ped-only plaza. Block 20 – Foundation permit for 21 story condo tower – This permit includes piles, pile caps, below grade utilities and slab on grade. Redevelopment of existing building to create ground floor warm shell retail and two floors – 10 units – residential units above. Including street landscaping. Separate tenant improvement permit required for occupancy of 1st floor shell space. Partial Permit for new 8 story building, scope includes erosion control/site preparation, excavation/piling, underground utilities, entire concrete structure. Construct new 103,912 sq ft, 3 story self storage building with associated utilities, parking and landscaping. The “Centers and Corridors” identified in the 2035 Comprehensive Plan. 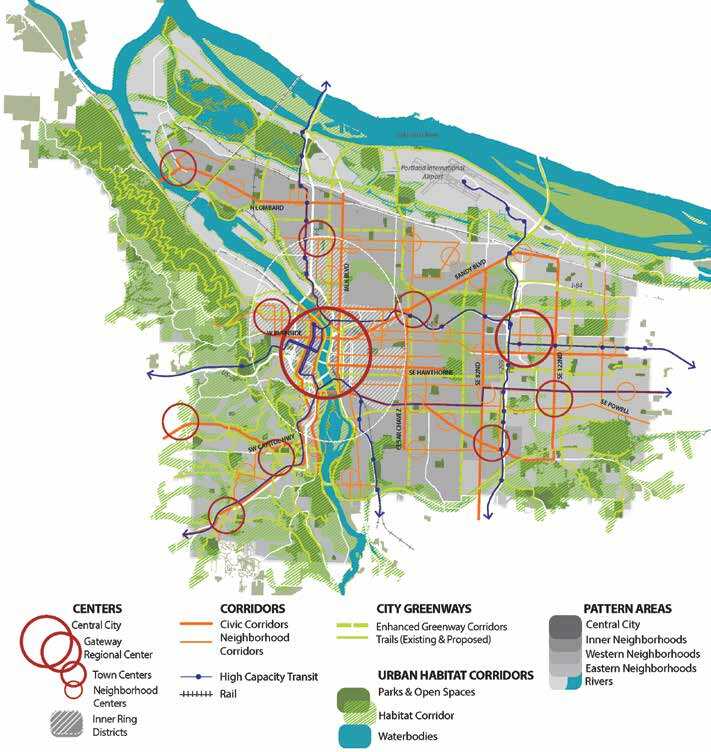 In the next 20 years City Planners anticipate that 50 percent of Portland’s growth will occur in the “Centers and Corridors”. 30 percent will occur in the Central City, with the remaining 20 percent of the growth happening in the rest of the city. 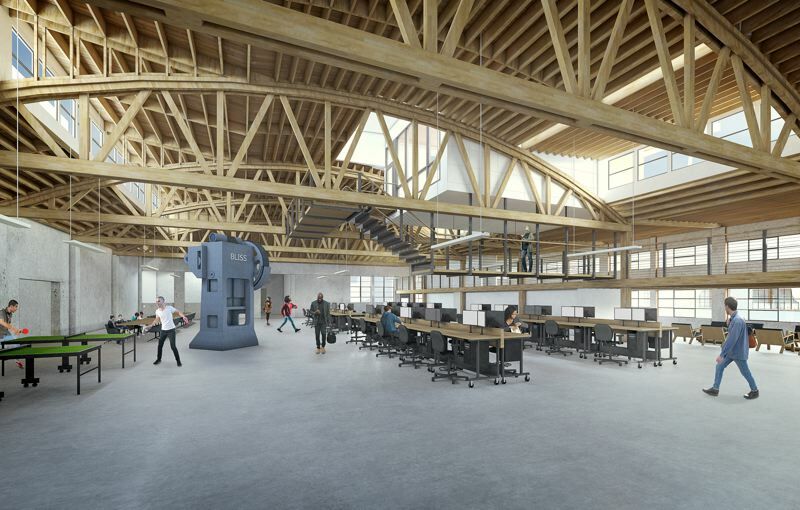 The DJC reported ($) on Urban Renaissance Group’s big plans for the Oregonian Publishing buildings at 817 SW 17th Ave. 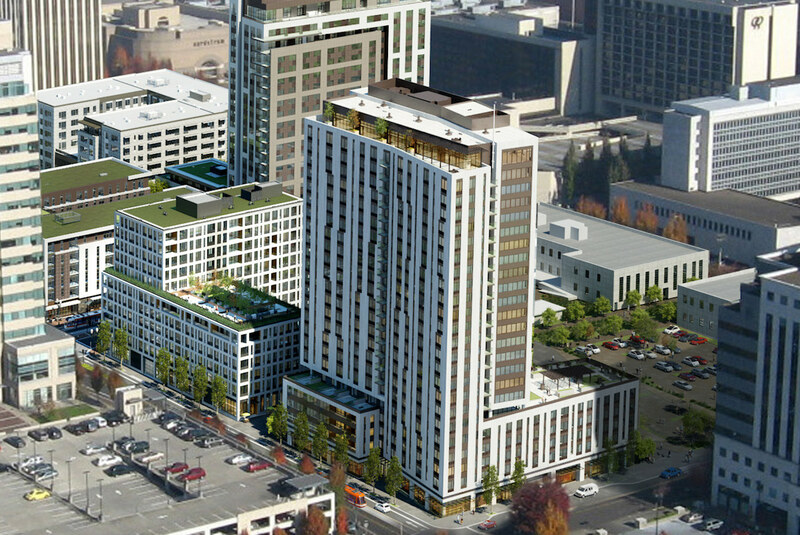 The redevelopment of the one and half blocks in Goose Hollow could include a full block residential tower by Mithun, with different options “ranging from 245 feet in 21 stories to 325 feet in 29 stories.” The half block parcel would developed as an eight story office building, 115′ in height, designed by GBD Architects. The Portland Business Journal reported on a potentially “catalytic” development on Old Town Chinatown Block 33. Guardian Real Estate is planning a project with “up to 300 residential units, ground-floor retail and a new hotel”. A proposed 1% Construction Excise Tax had a first reading at City Council, with all five City Commissioners indicated support for the proposal. The Portland Mercury reported that the biggest question was whether multifamily buildings should be treated as “residential” or “commercial” properties. OPB reported that ground was broken on the OHSU Knight Cancer Research Building. 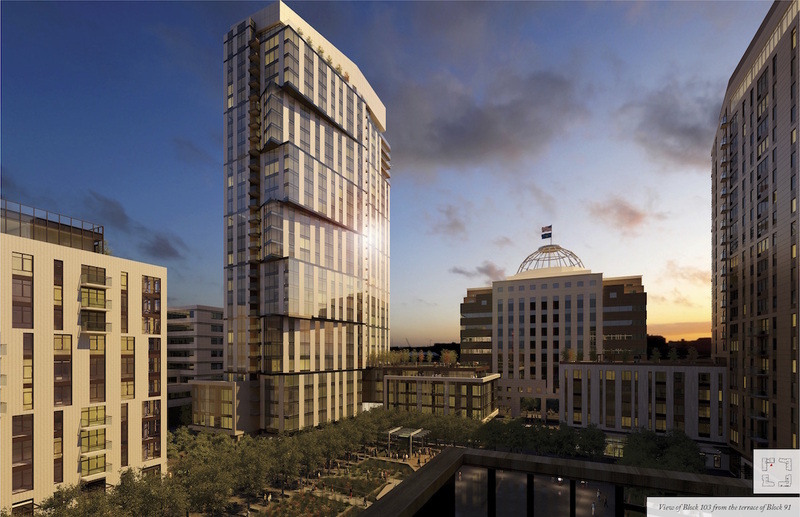 The Business Tribune covered the proposed changes to the Oregon Square development. A Pre-Application Conference was recently held, in advance of the submittal of a revised Design Review application. The City Council approved the 2035 Comprehensive Plan, the 20 year growth plan that has been years in the making. Changes to City code will start coming into effect in 2018. The Bureau of Planning & Sustainability has released the draft recommendations for the Residential Infill Project. OPB discussed what it could mean with two members of the Stakeholder Advisory Committee. The Oregonian looked into how the Lloyd Center Remodel could help the mall recapture the hearts of Portlanders. 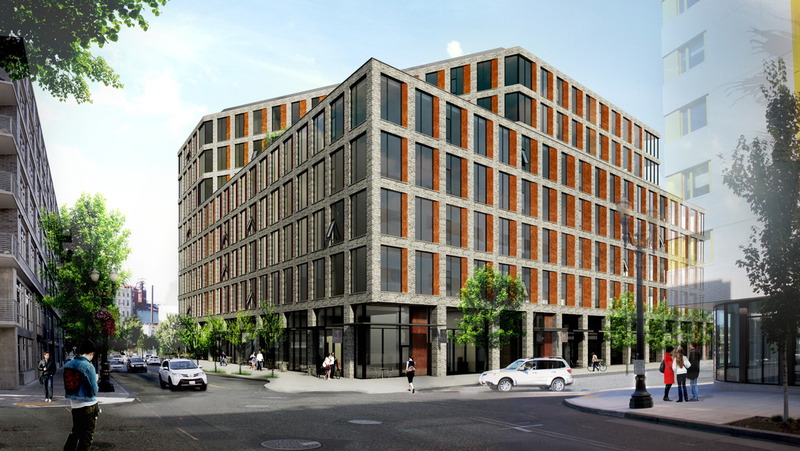 The DJC reported ($) that Oregon Square will be proceeding as a phased development. The western two buildings, Block 90 and Block 91, will be built first, and include around 560 units. American Assets Trust vice president and regional manager Wade Lange, quoted in the article, stated that they have asked GBD Architects to “keep it as close to the previously approved design (as possible)”. The former Slabtown bar at 1015 NW 16th Ave was demolished this week, according to the Portland Mercury. 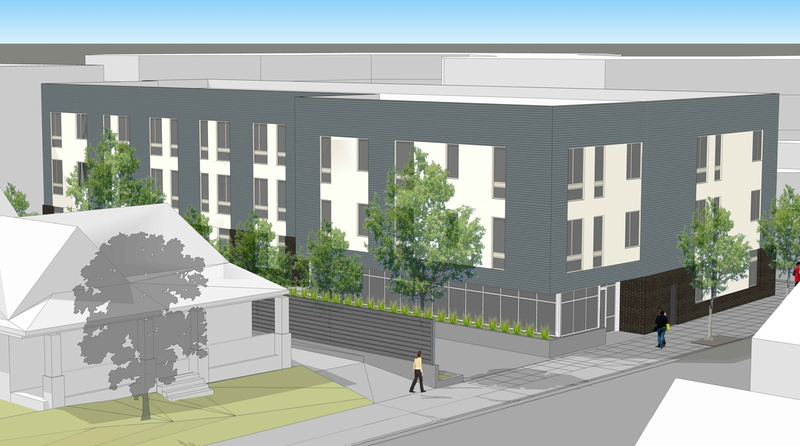 A new 6-story, 153-unit studio apartment building by Koz Development is set to replace it. The Oregonian reported that Portland is now the 26th largest city in the US. The paper noted that “between July 2014 and July 2015, Portland’s population increased 1.9 percent, or by 11,889 people”. Looking at the same data, BikePortland concluded that “Portland is finally adding homes almost as fast as people are moving here“. The Atlantic asked whether “Portland [can] avoid repeating San Francisco’s mistakes” around housing. The Business Tribune wrote about TVA Architect’s Spokane.13 apartment building, currently going up in the Sellwood neighborhood. The 4 story mixed use building will have 30 residential units and two commercial spaces at the ground floor. A building permit was issued for the Hill Park Apartments at SW 1st and Arthur. 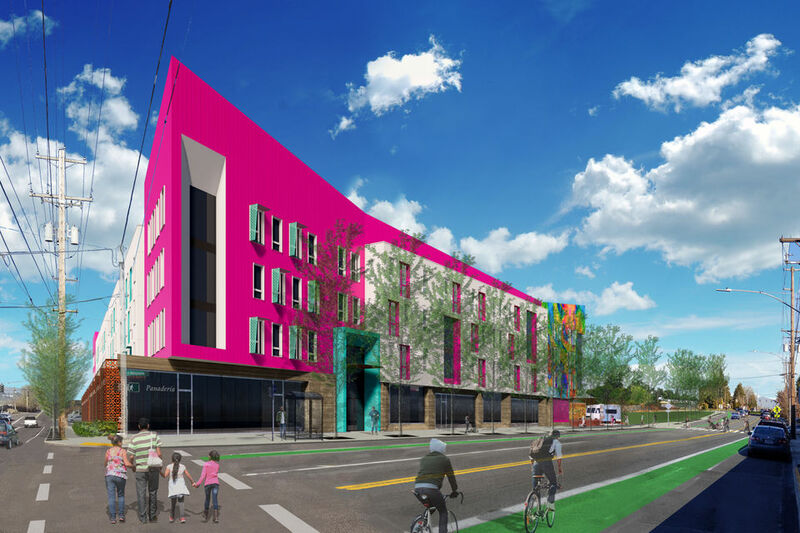 The building by Carleton Hart Architects for Central City Concern will include 39 units of affordable housing. Renovate building to include retail and commercial/residential uses, and development of 5 story 18,000 SF detached building for retail, commercial/residential uses. 2 towers – 1 23 story & 1 11story – residential development with underground parking connection. Ground floor retail – with outdoor plaza. Design review with 3 modifications for a 12-story market-rate apartment building with ground floor retail and below grade parking. 204 residential units are proposed with 145 basement parking spaces. Construct a six unit three story apartment building with 2 bedroom/1 bath units with living room, dining room, kitchen, and washer/dryer closet. Trash enclosure. New mixed use 4 story building, underground parking, first floor commercial use and 45 apartments above. Maximizing allowed commercial uses per COA in LU 06-118204 CP ZC, cannot expand corner retail space beyond square footage shown on approved ground floor plan, or convert two smaller office spaces to retail, to stay within 70 trip cap. This post is the fifth and final post in a series on Oregon Square, focusing on Block 103. See also Part I about the urban design and landscaping, Part II about Block 91, Part III about Block 102 and Part IV about Block 90. Rising to a height of 340′-6″, Block 103 would not only be tallest of the four buildings planned for American Assets Trust’s Oregon Square development, but would also be Portland’s tallest building east of the Willamette. The architects for the 30 story tower are GBD Architects, who are working with PLACE for the landscape design. The building will include 347 residential units and almost 12,000 sq ft of ground floor retail. A rooftop terrace is proposed for level 6 of the building, on top of the lower sidecar portion of the building. The 30th floor is proposed to be entirely given over to amenity spaces, including a community room, demonstration kitchen, private dining room, a fitness center, spa, and kung fu room.